We have hired Rooftopia for two significant projects at different homes, and have been extremely pleased with their work. Jenn and her team are deeply knowledgeable and creative, highly detail-oriented, excellent communicators, ethical, professional, and very pleasant to work with. Rooftopia also stands by their work. No major construction project is without hiccups, and Jenn and Marcin are honest, responsive, and quick to address any issue that arises. They also are just genuinely nice people who care about getting it right for their clients and take obvious pride in their work. 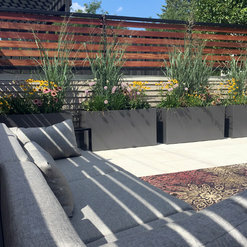 Both of our projects exceeded our expectations -- after several summers of enjoyment, the rooftop garden at our previous home was a major selling point, and guests in our current home are wowed by the gorgeous custom railings Rooftopia designed for our back porch reconstruction. 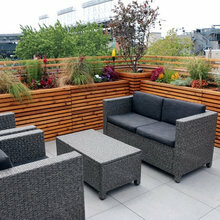 We are looking forward to hiring Rooftopia to complete the next phase of our rooftop renovation next spring, and wholeheartedly recommend them to anyone who is looking to create a beautiful and unique outdoor space! Jenn and her team are top notch, responsive, creative, incredibly flexible and a joy to work with. Everything is custom and tailored to you, they aren't afraid to experiment, take inspiration or adapt their big scale builds to smaller scale or paced out projects. All of her team members were awesome, professional and respectful of our space. 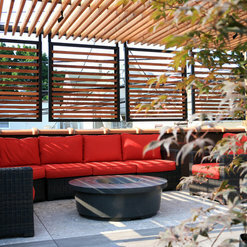 They finished the project on time, on budget and delivered high quality and unique final pergola construction. We get so much more use out of our deck now with the new pergola. 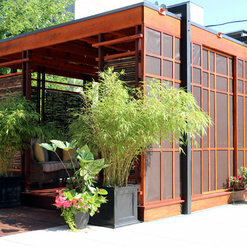 Our favorite part about our pergola was how they took inspiration from our love of Portuguese and Morrocan tiles and created custom metal screens to our pergola. 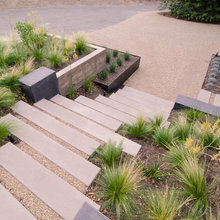 We recommend them without hesitation for any of your urban landscaping projects. We had a wonderful experience working with Rooftopia. There staff was easy to work with and they were able to turn our vision into reality. They listened to what we were looking for and the final project was better than we could imagined. We worked with Jenn and her team from design through implementation and are thrilled with the final results. 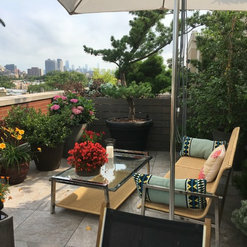 Our project while not huge had some challenges as we were having terraces on the 23rd floor landscaped with planters (container trees, grasses, annuals and perennials on one terrace and an edible garden of herbs and veggies on the smaller terrace). The plants selected needed to tolerate wind and sun. Rooftopia listened to our needs, preferences and feedback, and quickly made the requested changes on the design along the way until we were all satisfied. 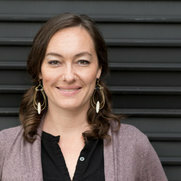 Jenn and the entire Rooftopia team were great to work with during every phase. We even received a compliment from the building on how courteous, professional and responsible the crew was at installation - they lwere extremely careful of the building and left everything in great shape. They are creative, hardworking and just plain fun to work with. From vision to finished project, Rooftopia was wonderful. Jenn and Marcin and their entire on-site team were consummate professionals, but on top of that just really, really nice people. The project was for an upper and lower deck and the finished project in Bucktown (pictures coming in the spring) turned out gorgeous. They also did a smaller front entry way project for us on a tight timeframe and it looks perfect, as well. The thing about Rooftopia is that they pay attention to every detail. The final product is so beautifully finished. A quick shout out to the "team" who actually came and worked at our home. They were there for several months. Having people working on your house can be hard. I absolutely cannot say enough good things about the people who came each day. They clearly took a lot of pride in their workmanship and were incredibly considerate and really, really wanted us to be happy. Combine our gorgeous outcome with an excellent design and management team and a great on-site team with wonderful craftsmanship and you can be sure that I would gladly recommend Rooftopia to anyone I know (and have already!). I can’t begin to say enough good things about Rooftopia and their crew! 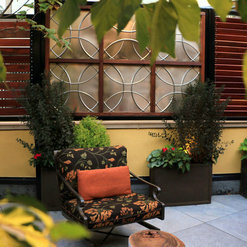 When I set out on this journey to reinvent my outdoor living space, I didn’t know what to expect and what was possible. 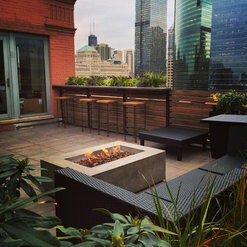 I met with several designers and contractors, and they all came to the table with typical Chicago deck designs. I called Rooftopia on a recommendation from a friend (and new client of theirs). I was not disappointed! From the moment I reached out to Jenn, Jill and Marcin, I knew this experience would be different. 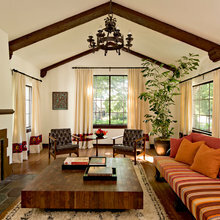 They are the ultimate professionals, and were genuinely excited to be able to provide me with a customized design that matched my vision for the space. I recently bought my home and knew the deck & rooftop needed immediate attention; it would be a massive undertaking for a new homeowner. Jenn & Jill were my primary contacts and they provided excellent, timely communication, and most importantly, honest feedback on what could & couldn’t be done. Marcin, and the entire onsite crew were equally as impressive. I knew I was in capable hands. We started in November 2017 with my garage rooftop, and will finish in the summer of 2018 with the lower deck. So far, the result has been a completely transformed garage rooftop! My new space looks like something you’d find in a restaurant, bar or lounge, not in someone’s backyard! I can’t wait for the summer so we can start the second phase. 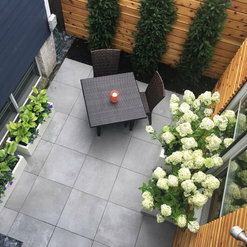 If you are on the fence, or maybe already decided but still looking for someone to provide a design & estimate for your own outdoor project, I wouldn’t hesitate to call Rooftopia! Rooftiopia was wonderful to work with. The project team made multiple site visits to make accurate plans for the project. When work was able to start the project lead was in full contact providing updates and schedule details. They were flexible and quick to adjust as things came up. The workmen were friendly, courteous, and diligent. They cleaned up after themselves at the end of every workday and stored items securely out of the way. The finished product exceeded our expectations. The quality of materials and work was some of the best I have experienced. Can't wait to use them in the spring for new projects! We love our finished roof top and get so much use out of it -not to mention tons of compliments on Rooftopia’s fabulous design! It has really added to our summer enjoyment! Jenn, Marcin and the entire Rooftopia team were awesome to work with! They were very professional, set expectations, communicated well and they finished on budget! We had a great experience and we would highly recommend them. The project we hired Rooftopia for is the one entitled "West Chicago Backyard Rehab" on this site. The best part about working with Jenn and Marcin is that they really are a one-stop shop. We knew after buying our house that the back deck was going to be Big Project #1. The old, wooden deck that came with the house was literally falling apart, the concrete pathway and back steps were cracking as the ground had shifted and sloping toward the house. After meeting with Jenn and explaining all of our concerns to her, she put together a concept drawing that perfectly reflected our vision. They took care of everything, from the demolition of the old deck, repairing the garage roof, building the new frame, leveling the ground, putting in landscaping and lighting. We couldn't be more happy with the end result! They completely transformed our unusable ground space to something we used all summer long, it was like adding a full room onto our house! 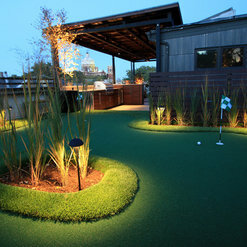 The landscaping and lighting is beautiful. As with any renovation project, there were a few bumps along the way, but Jenn and Marcin handled everything very professionally and made adjustments along the way. I would highly recommend you work with them! 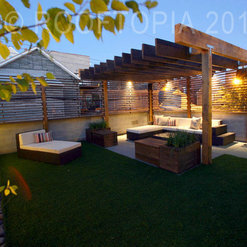 Rooftopia completed our large terrace deck and we were thrilled with the process and the results. They did a great job. It's absolutely beautiful. It can be difficult working in a high-rise building, but they made it easy. Their team is highly skilled and they were very professional. We give them a thumbs up! Rooftopia built and installed a new awning, balcony rail, and gate door for us and we could not be more happy. They did an amazing job. We wanted something industrial and modern but still feel like home. 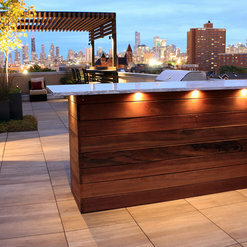 They came up with a clean look using both a warm cedar and heavy steel. Their communication was always clear and punctual, and their crew was very pleasant to have on sight. The experience and results from Rooftopia get five stars! Jenn and Marcin were great at every step... design, knowledge of materials and execution of construction. The other people they worked with are also qualified and professional. Commented: Stunning! What is the name of the tree?Thank you so much! Those are a columnar Norway Spruce called 'Cuppressina'. Good luck! 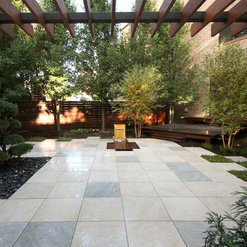 Commented: I love the clean and contemporary look to the patio!Thanks so much! These pavers are made by Unilock. They have lots of porcelain options/colors. These are called Gotham Grey. Commented: what's the name of the red tree?This was a variety of Red Maple, planted in 2013.